Size: Workers are about 1/8 inch long. Color: Odorous house ants range from dark brown to shiny black. 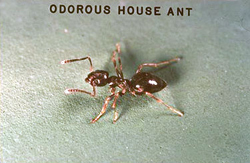 Habits: The odorous house ant gets its name from the strong odor it gives off when it is crushed. The unpleasant aroma is likened to rotting coconuts. Odorous ant colonies can have up to 10,000 workers who forage for food in long, distinct trails. These long trails of ants are often seen indoors as they crawl over and contaminate various household surfaces. Outdoors the odorous house ant makes shallow soil nests under any material on the ground, within hollow trees, or in any other available cavity. Indoors they build their nests in wall voids, under insulation in crawl spaces, or within cavities in wood. Diet: The odorous house ant will eat just about any sweet food but prefers the honeydew produced by aphids and mealy bugs. Reproduction: When a new colony is initiated, a queen lays a small batch of eggs and tends to the larvae that hatch. The adults that develop from these larvae go on to become workers and take over colony labor activities. During cold winter months, adults become inactive and larvae development slows. In spring, queens resume egg laying and colonies grow substantially during spring and summer. Odorous house ant colonies can produce hundreds of laying queens. Other Information: When they become alarmed, workers run around in an erratic fashion with their abdomens raised in the air. Colonies have been knows to grow to more than 100,000 ants. Size: Workers are usually 1/4 inch to 1/2 inch while queens can grow as large as 3/4 inch. Color: Carpenter ants range in color from tan to black. They can also be reddish or orange in color or have a combination of black and red. Habits: Carpenter ant colonies, which can have up to 100,000 workers, are usually found within buried or partially buried moist wood such as dead trees, rotting logs and stumps. They also construct nests in houses, telephone poles, and other wooden structures and are commonly found in porch pillars and roofs, windowsills, and other wood in contact with soil. Carpenter ants establish a parent colony and then branch off satellite colonies that may be in a structure. They workers maintain contact between the colonies as they travel to and from each colony over well-defined trails. 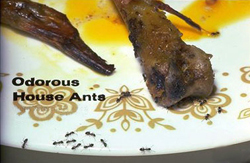 Diet: Carpenter ants dine on a wide variety of foods. Although their natural food sources are other insects, plant juices and the honeydew produced by aphids and other insects, they will readily forage for water and food scraps inside a house. Reproduction: Generally there is a single fertilized queen in each carpenter ant colony and she creates a nesting site in a cavity in wood. This is where she raises her first batch of workers, which dine on her salivary secretions. The first workers begin to gather food to feed the younger larvae. As more and more workers mature and begin gathering food, the colony grows rapidly. A colony must contain about 2,000 workers in order to produce young queens and males and can take up to six years to reach this stage. Each spring, mature colonies produce winged reproductive ants, called swarmers, which fly out to start new colonies. These swarms often occur from satellite colonies within homes, so homeowners may see large swarms of flying ants inside their homes at night. 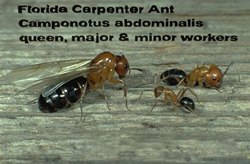 Other Information: Carpenter ants do not actually eat the wood they remove during nest-building activities. Instead, they deposit it in piles just outside the entrances to the colony. The wood is used solely as a nesting site. Size: This is a highly polymorphic species, with various sizes of workers within a single colony. The largest workers in the colony can be as much as ten times the size of the smallest workers. Color: The red imported fire ant is covered in long, bristly hairs and is identified by its red head and thorax and red and black abdomen. Habits: The red imported fire ant is one of the worst ant pests in the U.S. in terms of human health, property damage, and environmental damage. Colonies may have several hundred thousand workers and dozens of queens, and workers very aggressively defend their nest with stinging. Nests are created in the soil and can be identified by the large mound of soil raised above the surface. They are very common in turf. Red imported fire ant nests may go as deep as eight feet in the soil, and produce mounds above ground that are three feet tall and two feet wide. When their mound is disturbed they will rapidly overwhelm the intruder and, on a chemical command, begin stinging simultaneously. Nests may be found in wall voids, rain gutters, bath traps, and under carpets, as well as in electrical equipment. Diet: The workers are aggressive predators, feeding on any other insects they find as well as small mammals or birds, earthworms, frogs and lizards. They dramatically alter the natural habitat when they move into an area. Reproduction: Males die after mating and the female creates a brood cell in the soil and deposits 10-15 eggs using her tube like ovipositor. These hatch in seven to ten days and are fed by the queen. Within 15 days, pupae emerge and begin to forage for food. Within 30 days, larger workers emerge and the colony grows. The queen lives up to seven years and produces an average of 1,600 eggs per day throughout her life. A red imported fire ant colony can hold more than 250,000 ants. Other Information: Most red imported fire ant stings result in a raised welt that becomes a white pustule. If a person is allergic, however, he or she may experience a more grave reaction. Victims rarely receive a single sting; instead, a person typically receives many hundred stings simultaneously. 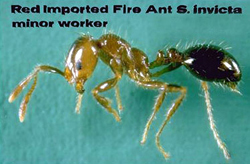 Red imported fire ant colonies may contain numerous queens and have multiple satellite colonies. Up to 200 mounds per acre have been found.